Pterodactyls Are Not Dinosaurs. So What The Hell Are They? Pterodactyls lived at the same time as the dinosaurs—but somehow, they’re not actually dinosaurs. 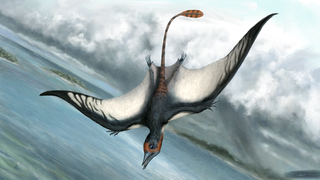 They were flying creatures, and paleontologists keep telling us that dinosaurs are birds. But still, we’re supposed to call pterodactyls “pterosaurs.” This feels like a trick—why aren’t pterodactyls dinosaurs? This name linked pterosaurs with dinosaurs in the popular imagination—which wasn’t a big deal, because for quite some time paleontologists had no real working definition for dinosaurs. They had scientific names for the different fossils they had discovered, but for them the definition of a “dinosaur” was no different from a bright ten-year-old’s idea of a dinosaur. A dinosaur was defined by popular imagination, not physiology or descent. In the 1970s, the entire discipline of paleontology took a look at the groups they had placed their fossils in, and found those groups wanting. After re-examining the details of different fossils, they finally came with a new order of things. The wide base group of that order came to be known as Archosauria. You can see crocodiles, the result of one branch of that group, staring up at you from ponds everywhere from Australia to the Florida Everglades. Another branch from that group is called Avemetatarsalia. Anyone who has had a foot injury knows that metatarsals are located in the foot. The ankle joint of a member of Avemetatarsalia is slightly different from other members of Archosauria. A section of bone that would have been part of an early crocodile’s leg is part of an early member of the group Avemetatarsalia’s foot. This makes the foot work in a slightly different way—a way that can be exploited to get up one one’s back legs and use one’s front arms to grasp, to walk, or to fly. There are other distinguishing characteristics, including elongated metatarsals, a longer neck, and differently-constructed legs, but it’s the ankle that’s the give-away. What did the members of the Avemetatarsalia do with their snazzy new ankles? Some became Scleromochlus taylori. Scleromochlus taylori would, if shown to most of us laypeople, be immediately identified as a dinosaur—albeit a very slender and elongated one. According to people in the know, however, it has a relatively primitive ankle structure. That ankle structure was shared by every animal in the group Pterosauria. In fact, Scleromochlus and the Pterosauria sit together on this stubby branch of the evolutionary tree. The animal pictured above and pterosaurs are each other’s closest relatives. To be fair, the pterosaurs didn’t have much use for their ankles. New evidence shows that they were more resourceful in flight than people gave them credit for. They were able to control their body temperature with a fine covering of hair-like fuzz. Their wings were not simple membranes to help them glide, but actual fliers. And they even managed to vault themselves into the air. But they were on a separate branch of the classification tree from the the members of Dinosaurmorpha—which still weren’t dinosaurs. And they weren’t among the group of animals that branched out from Dinosaurmorpha to become Dinosauriformes—still not dinosaurs. It took yet another branch to get to Dinosauria. Dinosauria had all kinds of limb improvements, from a crest on the humerus to a tibia with a “transversely expanded subrectangular distal end.” It’s no wonder that they probably spent the time between 220 million years ago and 200 million years ago wiping out most of the Dinosaurimorphs. Dinosaurs really did rule the Earth. Which makes it admirable that pterosaurs hung in perfectly fine until 65 million years ago. They only went extinct when the actual dinosaurs did. So what is the difference between pterosaurs and dinosaurs? The complicated answer is a lot of slight but specific changes to the leg bones. A more general way to look at it though is thinking of a dinosaur as yourself and a pterosaur as your grandmother’s sister. She’s a couple of generations back, and you’re not really her descendant, but you’re both in the same family, and come from a common ancestor. But she can fly, so she’s cooler.